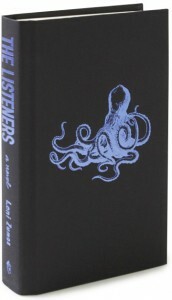 Leni Zumas is the author of the story collection Farewell Navigator (Open City) and the novel The Listeners, recently out from Tin House in 2012. Her fiction has appeared in Quarterly West, Open City, Salt Hill, New Orleans Review, New York Tyrant, Columbia: A Journal of Literature and Art, and other magazines. She is an assistant professor in the MFA Program in Creative Writing at Portland State University. Check out the haunting book trailer by artist Luca Dipierro. Genevieve Hudson: The Listeners is filled with examples of renaming, not naming, and unusual descriptions. One example that comes to mind is a boy you describe as “a calamity-haired baby spark.” Do you think of ways to defamiliarize as you write? How does it play a part in your process? Leni Zumas: My debt to Viktor Shklovsky is huge. Reading his essay “Art as Technique” years ago broke wide open, for me, the idea of strangeness in fiction. In Shklovsky’s view, “estrangement” is crucial to sensation: the reader must experience something as slightly off-kilter, off-expectation, in order to see/hear/feel it as if for the first time (and thereby to be moved by it). The things we’ve already seen—or believe we already know—lose their ability to move us. So as I wrote The Listeners, I was always trying to avoid terms so familiar they’ve grown dead, or at least deadening. GH: You mentioned in another interview that this book took you 5 years. What was the experience of writing a novel like in relationship to short stories? LZ: It was probably closer to six years, all told. I’m slow! I worked on other projects in between bouts with The Listeners (including most of the stories in my first collection) but the novel itself did take a long time. I wrote short stories as relief from that confining novel-world, and also for the pleasure of completing something. Stories can be so satisfying when you decide they’re finished, whereas this novel never gave me that satisfaction. It was more like a surrender, as in, Okay, I’ve done all I can. GH: Quinn isn’t gay, but she is androgynous and has some more masculine tendencies. You’ve mentioned that in a first write of a novel, the character of Quinn was a male. Can you speak a little about gender and the construction of Quinn? LZ: When I first started the book, its narrator was a stalled creature with classic symptoms of the aging loser: boring retail job, drank heavily, borrowed cash from his parents, played a lot of video games. His intelligence and tenderness were mostly hidden behind his stunted behavior. The novel was the story of Zed’s family, which had been gutted by the murder of his sister. Something about the book wasn’t working. The narrator felt too familiar, too much of a type. So, after I had written almost a full draft, I made Zed into a woman called Quinn. Almost nothing else about the character changed. Same job, drinking habits, tics of gesture and speech. In a female body, Zed would be—I hoped—less of a cliché and more of a curiosity. A woman in her mid- to late thirties who lives alone, eats no vegetables, gives no thought to having children, and fills her hours with “adolescent” pastimes is a less typical specimen than her male counterpart. To hear Quinn talk about taking a dump in the middle of the floor is more jolting, perhaps more revolting, than to hear it from Zed. I worried some, afterwards, about the change. Was I taking a shortcut? Was this gender shift somehow sheerly cosmetic? Gradually, as the book went through draft after draft, Quinn’s character settled into herself—into her own peculiar consciousness. GH: Quinn has a fraught relationship with food, the body, and blood. There’s also the illusive blood worm. In an obvious way her hunger strike is about rejecting blood, because of trauma, but in another way it seems a rejection of adulthood. Is Quinn struck with Peter Pan syndrome? LZ: Certainly she has problems with adult responsibilities and longs for the good old days of reckless abandonment. Her fear of blood, and her avoidance of food in order to stop getting her period, derive from such a specific event (her sister’s death by shooting) that I don’t know if I’d link them to Peter Pan syndrome. It’s true, though, that when Quinn’s food-restricting resurfaces in her mid-thirties, her parents get worried the same way they did when she was fifteen. And she asserts her right to self-destruct with an equal vehemence. So yes, she’s regressive. Her teenagey disdain for adulthood makes her kind of frustrating—even unappealing?—but I was interested in writing a character who wasn’t especially valiant or winning or “admirable.” Quinn does make strides, but they’re clumsy. Tentative. GH: Why did you choose to use quotation marks? LZ:I love this question because it makes visible a convention so commonplace it’s virtually invisible, much of the time. I like not using quotation marks for the great slipperiness it gives you: that moment where the reader doesn’t quite know whether a phrase or sentence is being spoken, thought, narrated, etc. The membrane between interior and exterior gets torn down, again and again. But in this novel I was actually afraid of too much interiority. I didn’t want the world as narrated by Quinn to submit wholly to Quinn’s vision. Didn’t want her voice sucking the air out of everything. Hence, quotation marks, to let some air in. GH: As someone who teaches in an MFA program and has obviously heard grunts about the way a workshop can kill a story of its creativity—or streamline it into a certain aesthetic—what are your thoughts on how to use the workshop in a different way? LZ: I have heard those grunts, yes, but I’m confused by them. The grunts seem to rely on a series of oppositions—creativity vs. education, individual talent vs. collective mediocrity, divine inspiration vs. diligent practice—that are all pretty flimsy. Writers get better by reading, and reading is a big part of what you do as an MFA student. You’re exposed to fiction and poetry and essays you might never have encountered on your own, and these texts might open up your writing in all sorts of ways. Or you notice things in other students’ work that push you toward solutions for the problems in your own. And you have deadlines. Deadlines are really useful. I’m not saying the MFA experience is for every writer. Of course there are programs that privilege a particular style at the expense of others, or punish writers for straying too far outside whatever aesthetic corral has been deemed worthiest. But the same kind of privileging and punishing happens everywhere—not least in the mainstream publishing and bookselling industries. I’d argue that marketing departments stifle a lot more creativity than MFA programs do. Genevieve Hudson is a graduate student, writer, and educator living in Portland, OR. Her writing has appeared or is in forthcoming in Tin House online, The Collagist, Word Riot, NANO Fiction, Portland Review, and The Rumpus. She in the second year of her MFA.